“This is my Body… This is my Blood.” Matthew 26:26-28. Literal or symbolic interpretation? Zwingli, with tears in his eyes, extended the hand of fellowship, but Martin Luther steadfastly refused: “Yours is a different spirit from ours“. Luther walked out. The split was final. The unity of the Protestant Reformation movement was in tatters. Marburg, Germany. 1529. Martin Luther’s attempt to reform the Roman Catholic church and restore confidence in the Bible “alone” was in full swing. Years earlier, he had nailed his famous 95 theses to the Wittenburg church door, protesting abuses within the church. Four hundred miles away, in Zurich, Switzerland, a young renegade priest, Huldrich Zwingli, was beginning to do the same thing Luther had started in Germany. Both Luther and Zwingli felt that the Church of Rome had lost its way. Christianity needed to return to the Holy Scriptures as the pure, unadulterated Word of God. The medieval church had allowed man’s traditions to creep in and compromise the truth of the Gospel. Luther and Zwingli were hoping to stand together against what they saw as the corruption within the Roman church. The question about the Lord’s Supper was central. The official doctrine since the Fourth Lateran Council was transubstantiation. When Jesus uttered the words in the Upper Room, “This is My Body“, the doctrine explained that the bread, and consequently the wine, were physically transformed into Christ’s literal body and blood. Henceforth, every time the church celebrates communion, this same act changes the physical character of the elements when the priest repeats Jesus’ words. Martin Luther draws the line in chalk against Huldrich Zwingli in their disputation at the Castle of Marburg. The conflict between Luther and Zwingli split the Protestant Reformation into different “Lutheran” and “Reformed” movements. Martin Luther rejected this view as being too magical. Too much “hocus pocus”. However, Luther still believed that the words of Jesus should be taken literally. The physical elements of bread and wine becomes supernaturally united to the body and blood of Jesus. The body and blood of Jesus, though not identical to, was somehow present “under, with, and in” the elements. Huldrich Zwingli, on the other hand, did not agree. 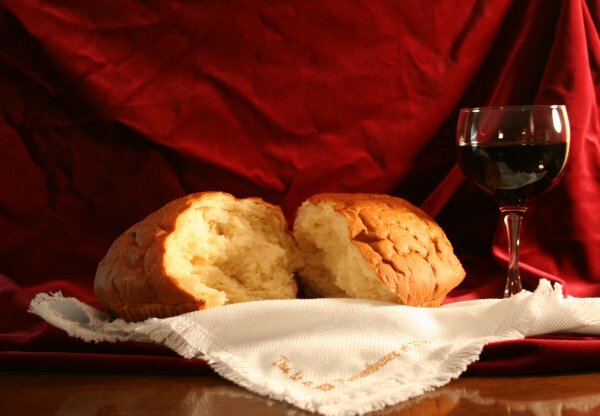 Zwingli argued that the bread and the wine of communion were merely symbols, metaphors testifying to the self-giving act of Christ on the Cross. When Christians partake of the Lord’s Supper, it is simply an act of remembrance, a memorial commemorating the supreme sacrifice of our Savior. Along with this and other disputes, the different parties of Swiss and German reformers called a meeting to be held at the Castle of Marburg to work out their differences. For the most part, the Colloquy of Marburg went rather well. Nearly every dispute was resolved…. until they got to the Lord’s Supper. Many evangelicals today find this conflict rather odd and academic, since we typically put the primary focus of corporate worship on the preaching of the Word. But we do not live in the 16th century. In medieval Catholicism, the celebration of the Lord’s Supper was the climax of worship. Unlike many evangelical churches today that only celebrate communion perhaps once a month, every service in the early 16th century church ended with the celebration of the Mass. Everything in the service, including the preaching, was focused on this final, crucial moment of corporate worship. According to medieval theologians, if you get this understanding of the Lord’s Supper wrong, the integrity of Christian faith and practice would fall apart and harm the Gospel. 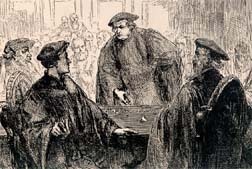 Luther walked away justified, thinking that truth had been served. He would not bow to the altar of political expediency. Zwingli, on the other hand, walked away frustrated and incredulous at Luther’s stubbornness. The bond that joined the Lutheran and classically “Reformed” churches of the Protestant movement was broken, and these denominational distinctives remain to this day. John Calvin’s Real “Mystical” Solution? 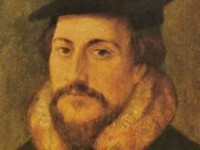 John Calvin, the young French Reformer, who inherited the leadership of the Swiss Reformed movement from Zwingli. Feed on Christ. Think about that the next time you celebrate communion. A lot more can be said about the different views of the Lord’s Supper, but one thing stands out to me about John Calvin’s approach. In recognizing the real presence of Christ, Calvin saw a profound sense of mystery in the celebration of the last meal Jesus had with His disciples. It is a mystery that somehow eluded the participants of the Marburg Colloquy. The role of mystery in biblical interpretation can be confusing to both critical skeptic and believer alike. For some, it can create a barrier to faith. For others, it can lead to a “hardening of the categories”, a fatal spiritual condition. Have you ever had your own “Marburg crisis”? If you have ever gotten stuck over the tension between the “literal” versus “symbolic” interpretation of a controversial biblical text, then perhaps you know what I am talking about. We do need to pay attention to sound principles of biblical interpretation, reading things in context, and so on. But often, these matters are not exercises in mental gymnastics, they are about matters of the heart. Tragically, some get so stuck in their “Marburg crisis”, they can miss what God is really saying to them. The lesson of John Calvin is that as we celebrate the Lord’s Supper, we can step back, get our head out of the game for at least a moment, and taste that Jesus’ Blood shed and His Body broken for us on the cross can and does heal us in our own brokenness. Now that is a real mystery worth celebrating. This blog posting is an adaption of Sam Storms’ blog, but you can find much of the same material in any good reference work on the Reformation. One of my favorites that goes in greater background detail is Roland Bainton’s, Here I Stand, the standard biography of Martin Luther. If you want an in-depth perspective that examines things more from Zwingli’s point of view, you may want to go here. For a Lutheran counterpoint, consider this essay by Trevin Wax, of the Gospel Coalition. Fun little trivia: some linguists claim that the expression hocus-pocus was originally derived from a corruption of the Latin phrase hoc est corpus meum, which in English is translated as “this is my body”, the priestly phrase recited during Catholic mass. This entry was posted on Saturday, March 23rd, 2013 at 8:09 am	and tagged with Calvinism, John Calvin, Martin Luther, Protestant Reformation, veracity and posted in Topics. You can follow any responses to this entry through the RSS 2.0 feed. Great post on something we today don’t normally think about. This is such an important aspect of the Lord’s Supper. He promised to be in our midst whenever two or three are together in His Name. Since He is already present, the elements of the Eucharist need be no more than symbols of Jesus’ body and blood, corresponding with John 6. Thank you for a great and clear post on this issue not yet solved between the Lutherans and the Calvinists. Thanks for following and commenting! It is absolutely amazing which mountains we choose to fall upon. Not even Luther could find a way to avoid infighting. It takes the wisdom and patience of God, as Christ demostrated so gracefully in Mark 12:17.